Raffles Hotels & Resorts, a hotel brand known for its impeccable service, started with one legendary property in Singapore. The group has since expanded around the world, with Raffles Dubai being its first-ever property in the Middle East. 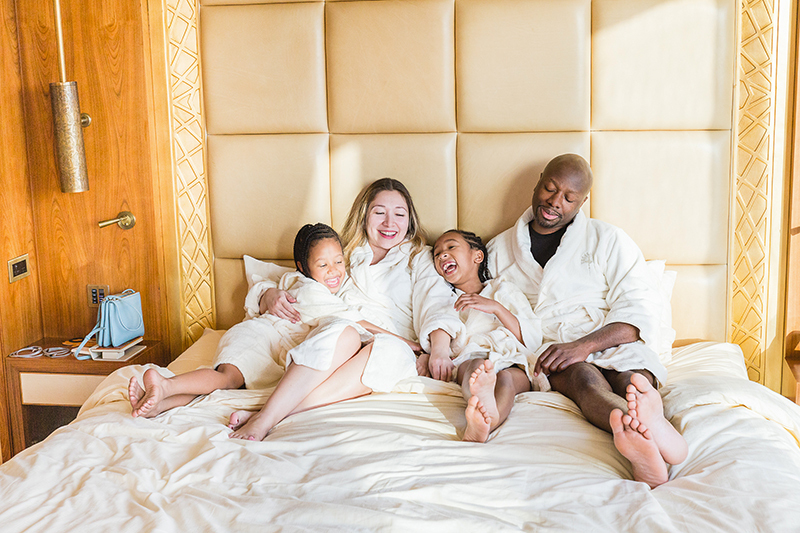 On our recent family trip, we were simply amazed by the fabulous décor, the massive hotel rooms, and the decadent dining options. 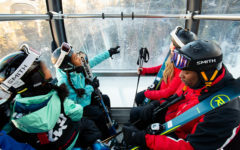 While it isn’t necessarily marketed as a kid-friendly hotel, the staff did an incredible job of making sure my girls had a memorable experience. Plus, with so many fun things to do nearby, there was never a dull moment. Many thanks to Raffles Dubai for hosting us. 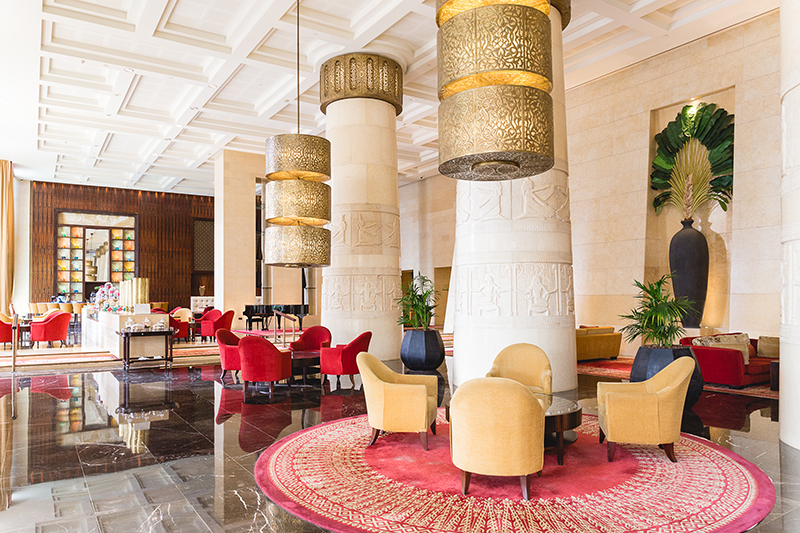 When you first walk into Raffles Dubai (check your dates for rates), you’ll be met by a chic blend of Asian and Egyptian aesthetics. 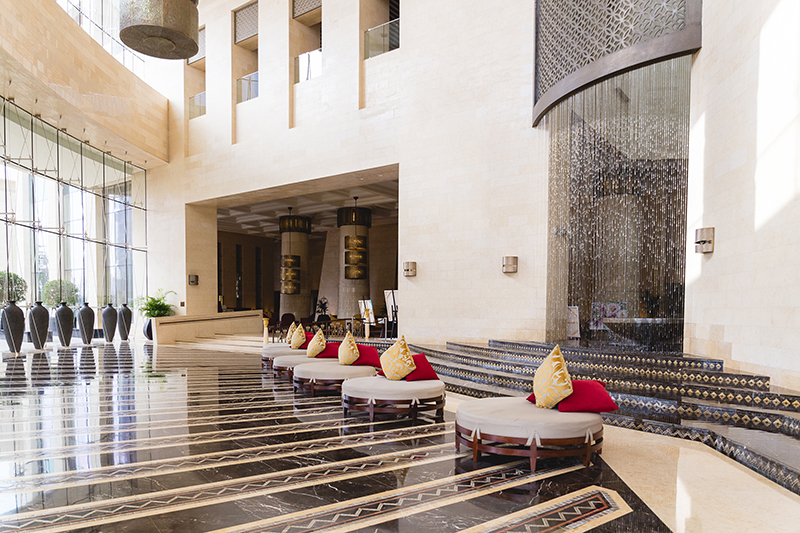 The marble-laden lobby is grandiose and awe-inspiring, reminiscent of a mega hotel in Las Vegas or Macau. The immense water feature is absolutely show-stopping. Beyond that, you’ll see massive ottoman-style sofas, mashrabiya panels, and enormous urns. While the exterior is quite over-the-top (think Luxor Hotel & Casino in Las Vegas), the inside is tastefully done. Raffles Dubai was built in a pyramid shape with an Egyptian theme to match the Wafi Mall, which is the heart of the area. (Fun fact: The matching, pyramid-shaped Wafi Mall was one of Dubai’s first major shopping centers.) That Egyptian theme carries through to the lobby, but is much more understated, consisting mainly of pillars engraved with hieroglyphs. 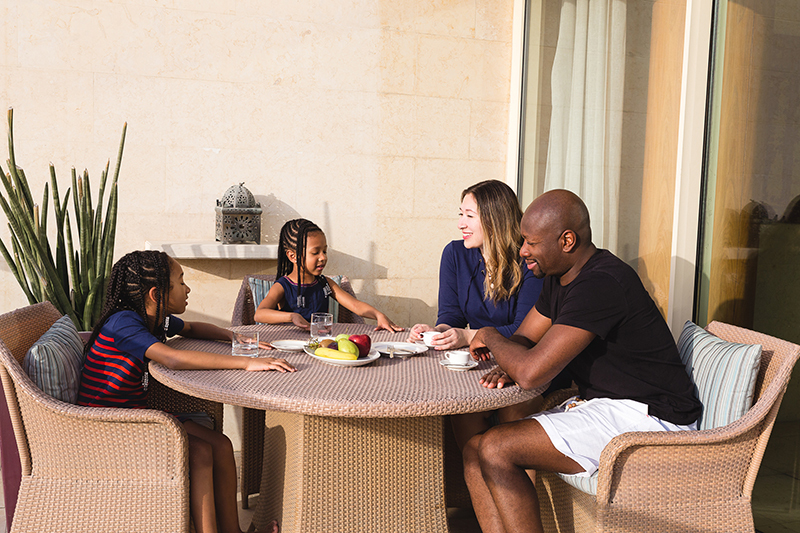 Raffles Dubai may not be near the beach, but it’s near everything else a family would want to experience. 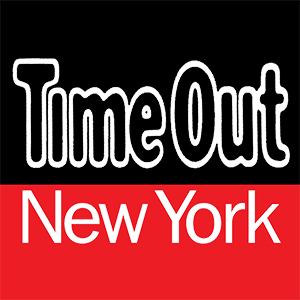 Situated near several malls and the financial district, there is plenty to do nearby, and it’s only 15 minutes from the airport. The hotel itself is connected to the Wafi Mall, which has a ton of activities for kids, including an indoor playground called Kids Connection; Tee & Putt Mini Golf, which is a glow-in-the-dark, 18-hole miniature golf course; a lazy river and swimming pool; and The Crèche, a child care center that can watch your child up to three hours at a time, so that you can shop or go to the spa. Wafi Mall has 300 stops ad 30 restaurants, so there’s definitely something there for everyone. 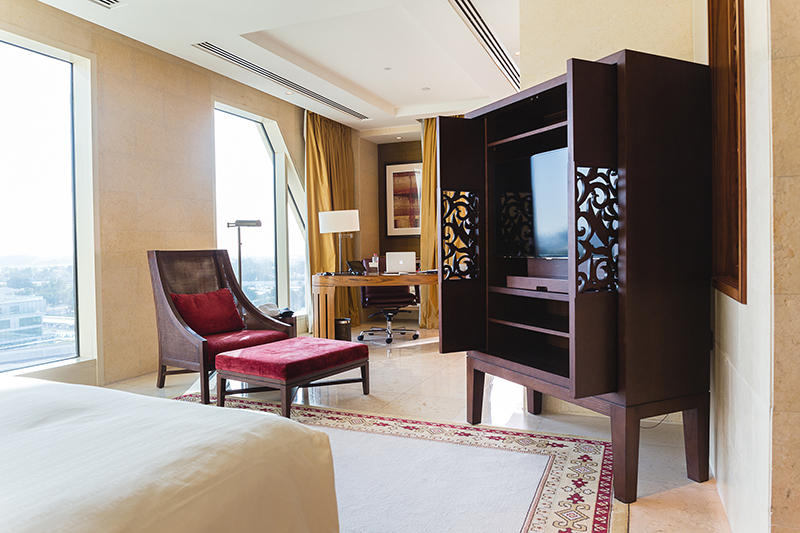 The Raffles Dubai is known for having some of the largest hotel rooms in Dubai. We stayed in room 930, one of the property’s spectacular Diplomatic Suites. Its wrap-around terrace provided stunning views of the Dubai skyline, including the Burj Khalifa, and was just as majestic during the day as it was at night. 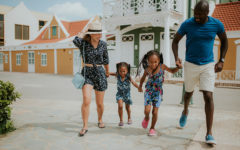 While not specifically designed for families in mind, it works great if you’re traveling with little ones. 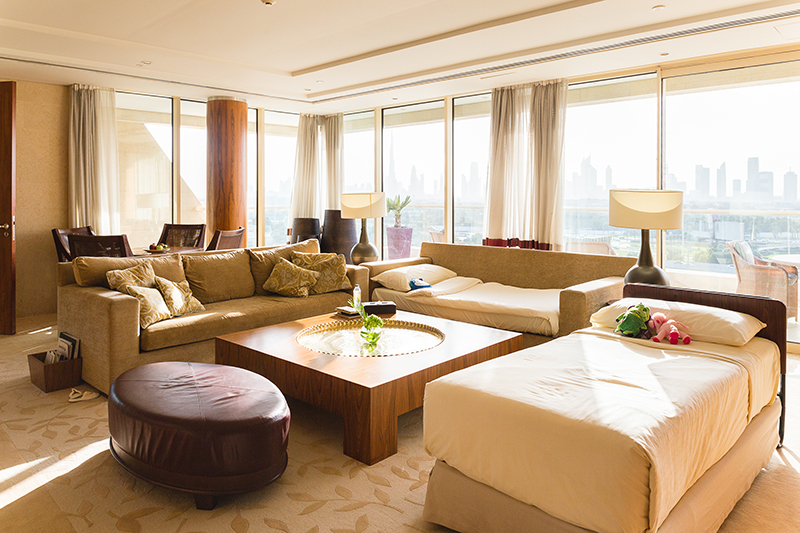 The dining and living areas of the suite have floor-to-ceiling windows, two large couches and a dining table. We made one of the couches into a bed for Sean, which left plenty of room for an extra roll-away bed for Ella. You won’t see much of the Egyptian theme carried into the rooms. 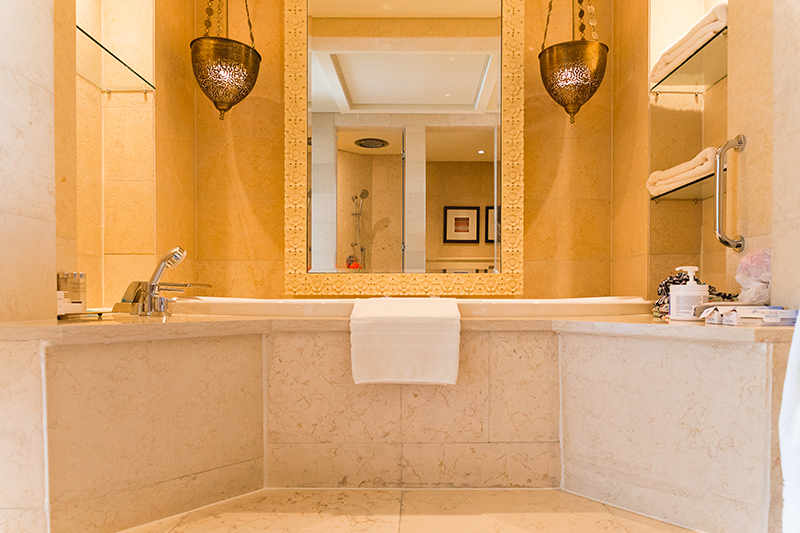 Instead, you’ll be treated to an elegant mix of neutral tones with gold accents, and a chic, Arabic-inspired feel. The master bed itself was gorgeous, with a tufted, upholstered headboard that stretched to ceiling. There was also a cozy desk area in the bedroom that was a great place for me to work. The walk-in closet even had its own vanity area. The bathroom was beautiful, with a spacious double vanity and an oversized shower, complete with a rain showerhead. The wall above the tub had a tall mirror with carved wood, latticework frame, flanked by two ornate, metal, pendant lamps. 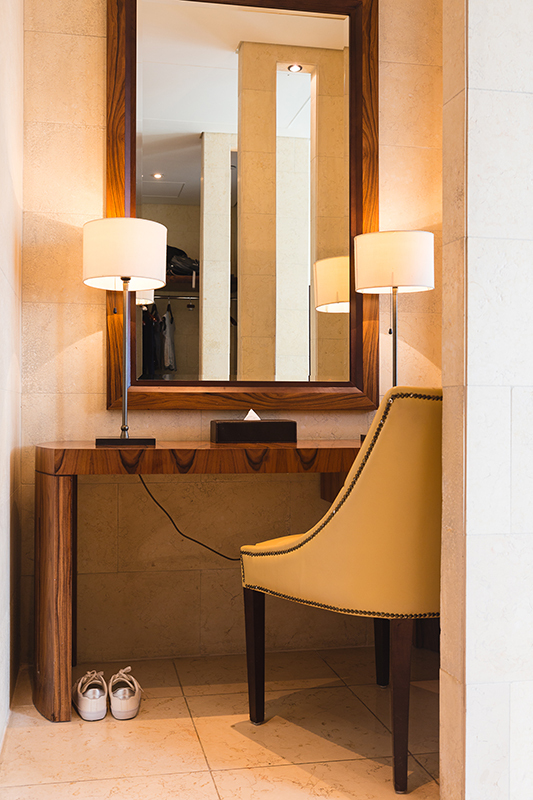 The Diplomatic Suites comes with Club Lounge access, which offers daily breakfast, afternoon tea, cocktails and canapés, as well as clothes pressing facilities. 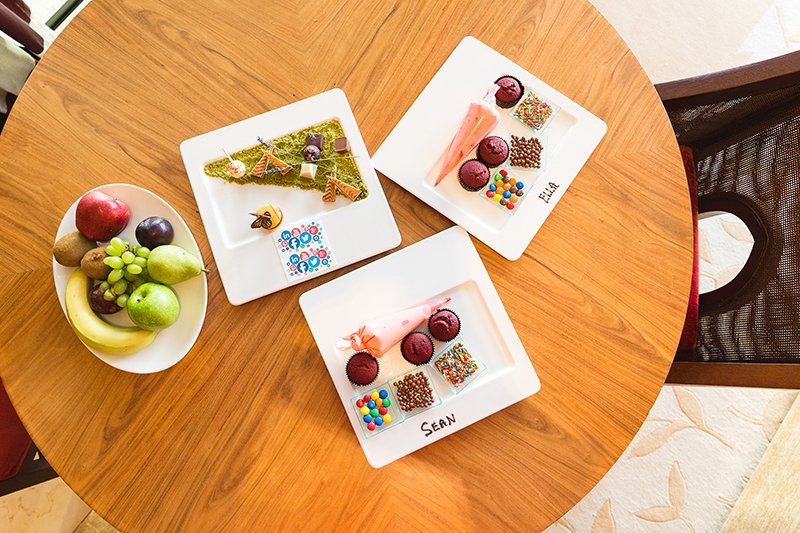 Is The Raffles Dubai Kid-Friendly? 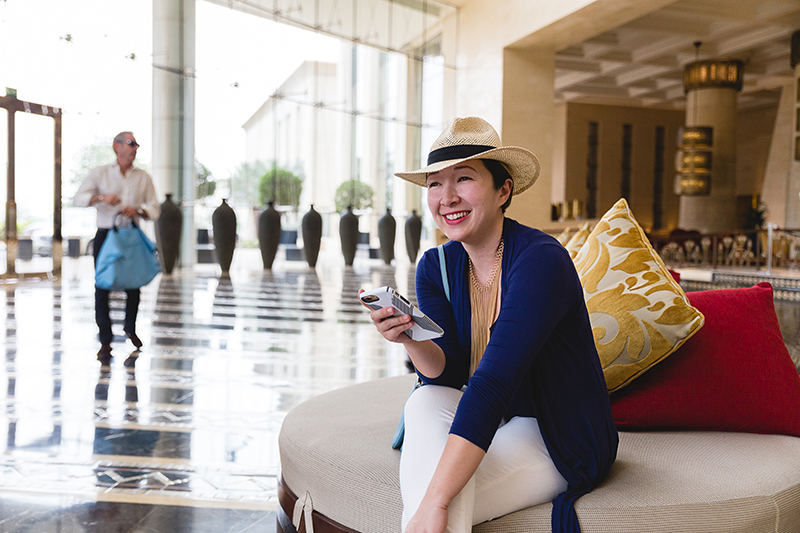 Raffles Dubai caters primarily to business travelers, so it’s not specifically designed for families. That said they did a great job of making our girls feel at home. 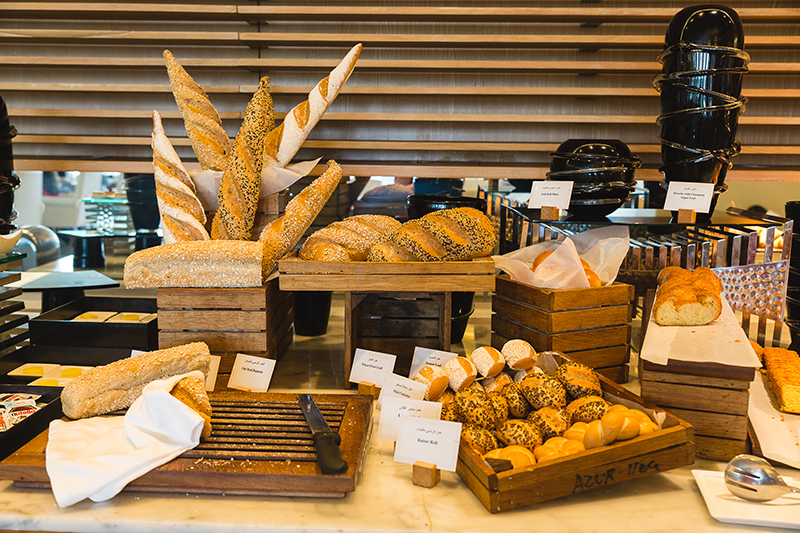 The most kid-friendly aspect is the breakfast buffet at Azur, a bright and airy restaurant. 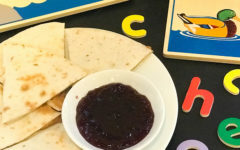 Children under 5 eat for free. Children between 6 and 11 eat at half price. At cart the entrance had everything kids love, from colorful plastic cups, bowls and cutlery; to the sugary cereals they’re only allowed to eat on vacation; to crayons and coloring books; to an assortment of gummy worms and M&Ms. On our way out after breakfast one day, I told the girls they were each allowed three gummy worms to take with them for later that night. They struggled to scoop the gummy worms into their to-go cups, and the manager offered to help. Much to their delight, he proceeded to tip the entire jar’s contents into their bowls! He definitely won brownie points with the girls! When we arrived for dinner at Solo, the hotel’s Italian restaurant and bar, the girls were grumpy and exhausted. We’d had a particularly taxing day, not made any easier by enduring bumper-to-bumper traffic on our way to check into the hotel property. 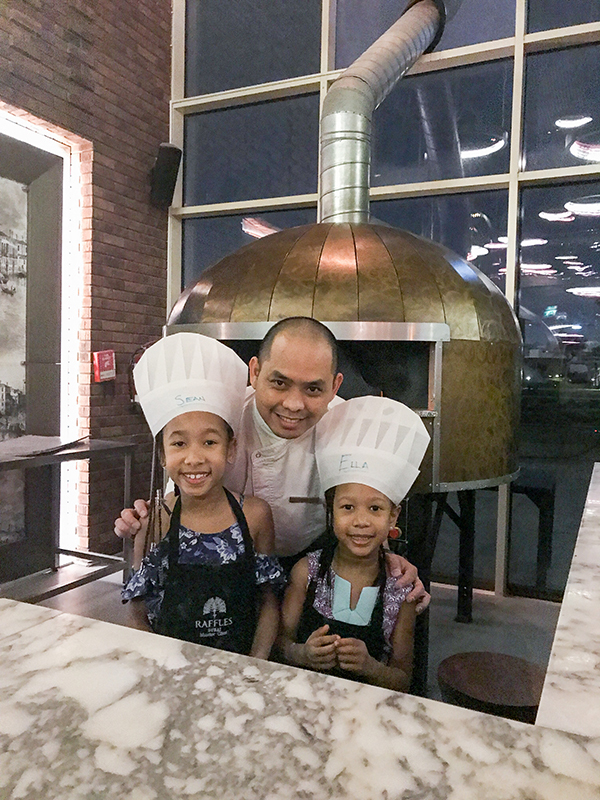 The team at Solo surprised the girls with aprons and chef’s hats, and whisked them away to learn how to make their own pizzas with the chef! The girls were elated and it completely turned our evening around. 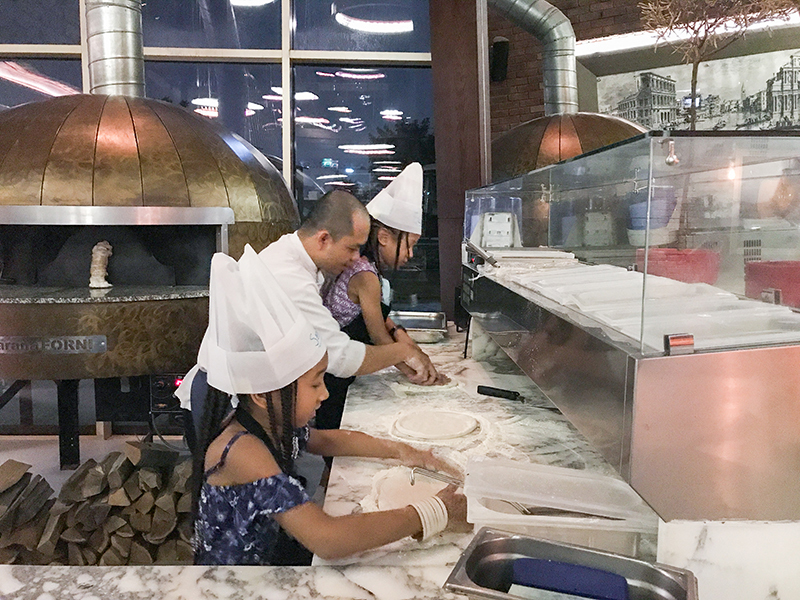 They felt so accomplished getting to make and bake their own pizzas in the wood fire oven. Not surprisingly, they finished every bite! 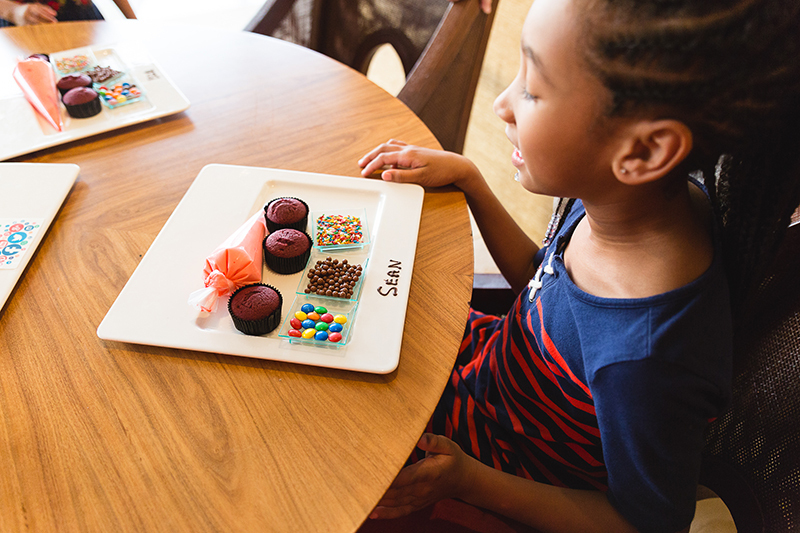 The next day, room service surprised the girls by delivering cupcake decorating kits for them, personalized with their names. Sean and Ella had so much fun decorating their cupcakes with icing, M&Ms and sprinkles. 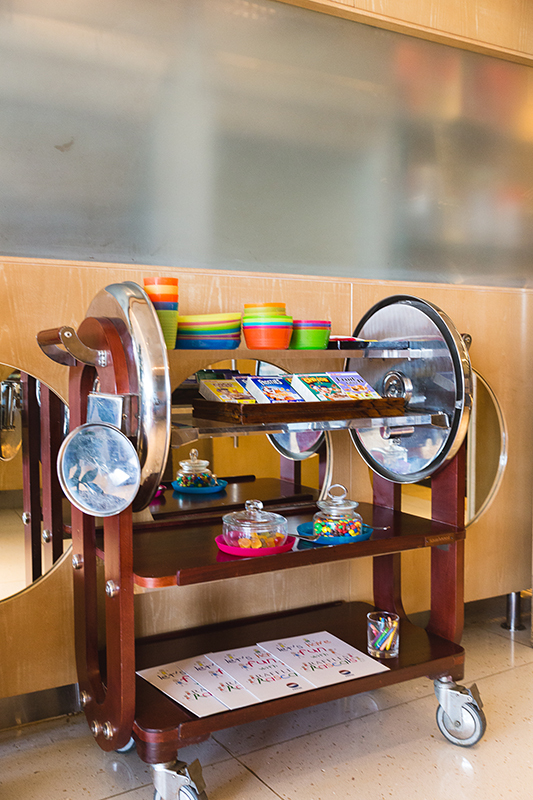 You can request these surprises for your own kids during your stay. 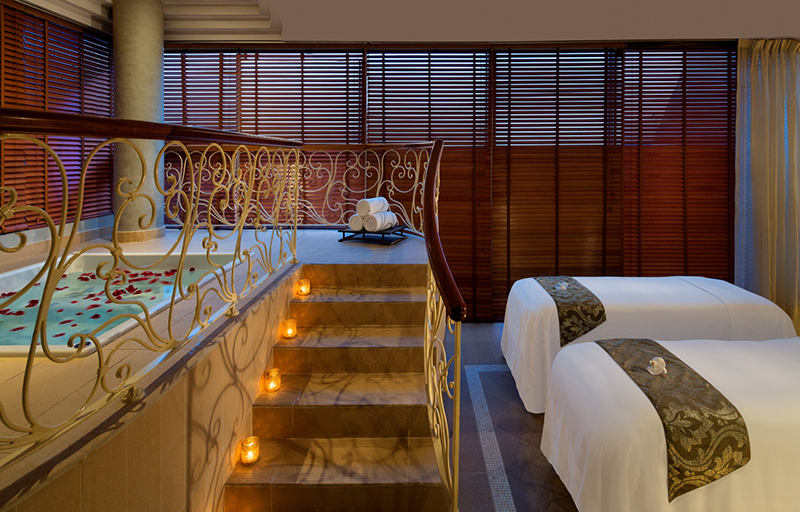 The Raffles Dubai Spa is beautiful and relaxing, featuring exclusive treatments that you can’t get anywhere else. It has male and female areas, whirlpool baths, sauna and steam rooms, as well as access to an outdoor pool. From the pool area, you’ll see more of those breathtaking, panoramic views of the city. Serge and I tried out the Rose Indulgence treatment, which takes place in the luxurious Couples Suite. It began with 30 minutes in a private whirlpool bath and was followed by side-by-side massages. Rose petals were strewn about the room, and we were served delicious, green juice and a fruit plate. 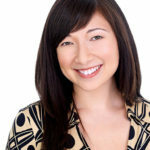 The massage itself was fantastic, and my therapist was very responsive to my directions. Grape seed grains were used to exfoliate the skin, and the treatment finalized with a hydrating facial massage. (Bonus: The spa bed was the most comfortable felt.) We were left with dates, baked treats, and tea in the relaxation room. The beauty of this restaurant alone is worth a visit! The elegant dining room is bright and airy, overlooking the Raffles Garden on the third floor. The outside terrace is warm and luxurious, surrounded by tropical flora. 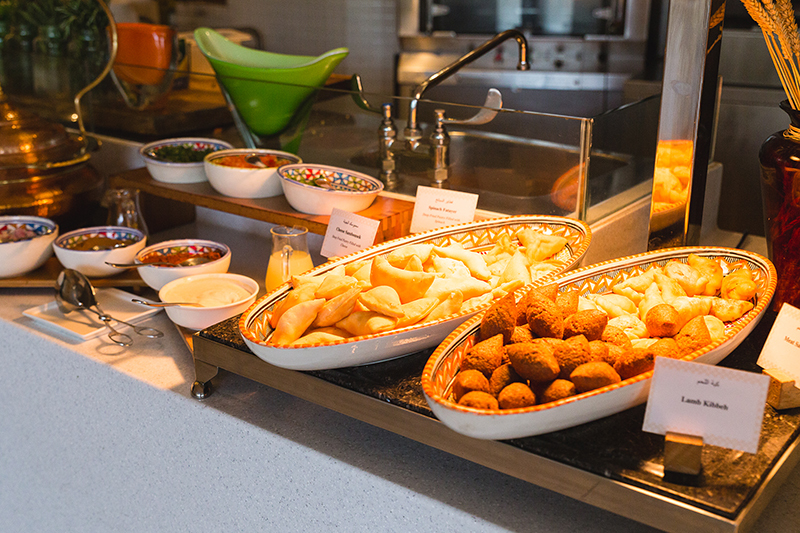 Expect a delicious array of international dishes (everything from Pan-Arabic, to Indian, to Chinese) in a buffet setting. There are also exciting live cooking stations, as well as an impressive selection of Arabic sweets. We dined here for the breakfast buffet each morning, which had different, fresh juices available daily. Note that pork is available, but is kept separate from the rest of the food. Here you’ll find generous portions of traditional Italian cuisine made with a modern twist. The atmosphere is relaxed with an open-plan kitchen, and meals served family-style. The restaurant sources its produce from local farms and imports seasonal ingredients directly from Italy. All of the dishes are made right there, in-house. 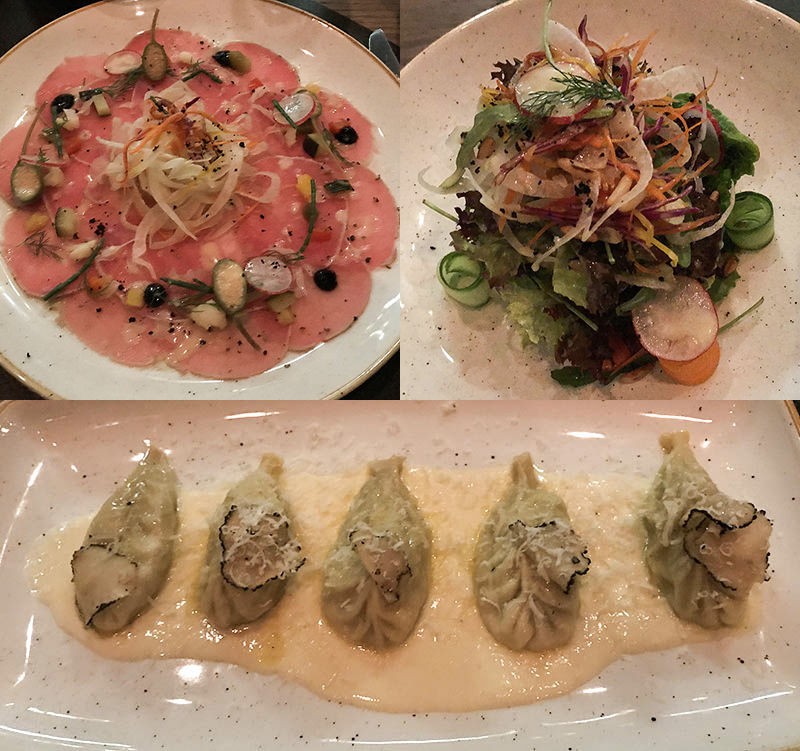 We started with the Capricciosa Salad and the Beef Carpaccio. For entrees, I had the Polpette E Pure Di Patate, a dish that combines slow-braised beef meatballs with veal sausage and mashed potatoes. While it was delicious, I was jealous of Serge’s simple, but absolutely mouthwatering lasagna, made with beef ragout, mixed wild mushrooms and Brescianella cheese gratin. We didn’t have a chance to try these other eateries at the hotel, but I’ve heard great things about them. For afternoon tea, check out the Raffles Salon. Known for its floral afternoon tea, this elegant restaurant is perfect for a mommy-and-daughter date. For drinks, check out Crossroads cocktail bar, which has gorgeous cabanas in the garden. And for date night, try TOMO. This Japanese izakaya-inspired establishment has incredible views of the city skyline. You have to make your way up there for an appetizer and a cocktail, at least! 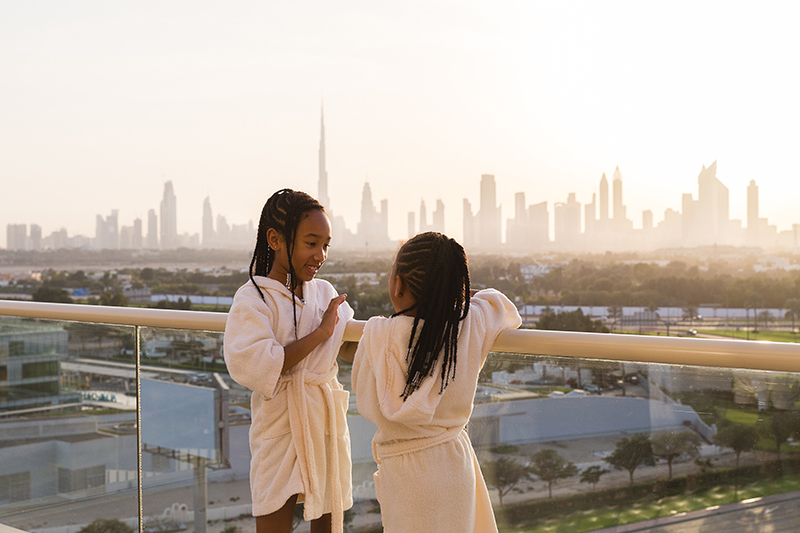 All-in-all, Raffles Dubai (check your dates for rates) is a great option for families looking for spacious and luxurious accommodations while traveling. The service is fantastic, the spa is pure indulgence, and the dining is phenomenal. You’re sure to snap plenty of Instagram-worthy photos while staying on the property! 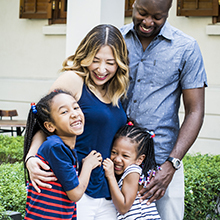 And while the hotel may not be on the beach, there is so much to do at the Wafi Mall that your family will be entertained the entire time regardless. So while planning your trip to Dubai, don’t overlook the pyramid-shaped hotel; Raffles Dubai promises to impress! We received complimentary accommodations, spa treatments and some meals from Raffles Dubai for the purposes of this review. All opinions are our own.